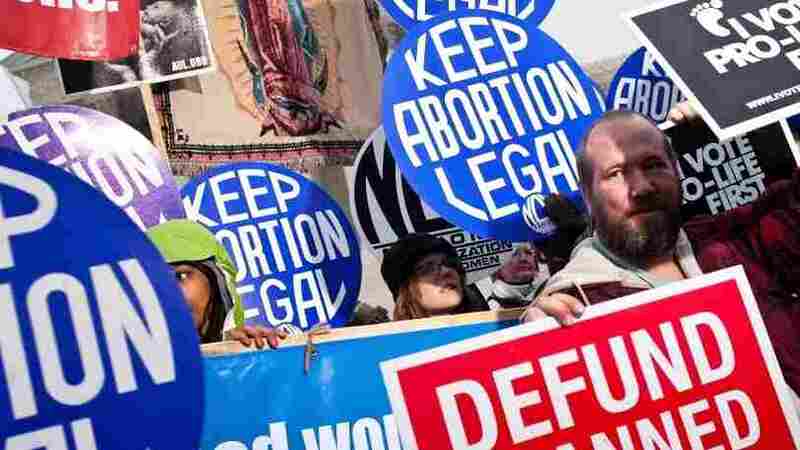 Abortion Debate Likely To Heat Up In 2012 Dozens of abortion restrictions passed in the states during 2011 — nearly a record since the Supreme Court's 1973 Roe v. Wade decision. This year, anti-abortion groups say they'll focus on bills that would ban abortions at 20 weeks, limit insurance coverage and grant constitutional rights to embryos. Last year was a pivotal one for abortion laws. Dozens of restrictions were passed in the states — nearly a record since the Supreme Court's 1973 Roe v. Wade decision, which legalized abortion. This year, anti-abortion groups say they'll focus on passing more restrictions, and on a state-by-state campaign to grant constitutional rights to embryos. The anti-abortion strategy this year is to pass bills that would ban abortions earlier, and to change the legal definition of personhood — an effort that would outlaw abortions. Among our top priorities this year is to continue to ensure Planned Parenthood is not receiving government funds, to pass clinic regulations that will ensure the health and safety of women, and also to ensure that insurance plans do not cover abortion. Last month, the National Right to Life Committee announced it would push bills to prohibit abortions at 20 weeks, based on the assumption that fetuses can feel pain. Five states have passed this law. Mary Spaulding Balch, state legislation director for the group, says that's just the beginning. "No serious challenge, no serious legal challenge, has been mounted to any of these state laws to date," she says. "And we know that these laws work." A version of the fetal pain bill was just introduced in Congress targeting the District of Columbia. Other bills would ban private insurance companies from covering abortions, and restrict federal and state funding to any abortion provider. That's a key goal of Americans United for Life. Kellie Fiedorek is an attorney with the anti-abortion group. "Among our top priorities this year is to continue to ensure Planned Parenthood is not receiving government funds, to pass clinic regulations that will ensure the health and safety of women, and also to ensure that insurance plans do not cover abortion," she says. Fiedorek says the 2010 midterm elections ushered in new conservative GOP lawmakers, and that led to the passage of more abortion restrictions — a trend she says is likely to persist. "In 2011, we saw 47 states consider more than 460 measures related to abortion. We saw 70 laws enacted," Fiedorek says. "And I would expect continuing progress in 2012." The Center for Reproductive Rights is fighting many of these measures in court, including laws in Texas and North Carolina that require doctors to show women ultrasounds and provide a detailed description of the fetus. Nancy Northup is the group's president. "In 2012, we will fight back relentlessly in the courts," she says. "And in the lawsuits that we have brought against the anti-choice assaults, we will be and are developing new legal theories that will get stronger protection from the courts." So far, the courts have been split in rulings on abortion laws. The Center for Reproductive Rights is also battling efforts to increase clinic regulations. Abortion opponents say they will make clinics safer — but Northup says they're unnecessary. In 2012, we will fight back relentlessly in the courts. And in the lawsuits that we have brought against the anti-choice assaults, we will be and are developing new legal theories that will get stronger protection from the courts. "What you see is this attempt to both reduce the number of providers by regulating them out of practice, and cutting off funding for insurance," she says. "And those are the kind of restrictions that have a big impact, and those are the kind that we're concerned about." And there's another strategy that worries abortion-rights activists — the "personhood" campaign. It's a state-by-state effort to pass a constitutional amendment that would expand the definition of a person and grant legal rights to embryos. Last month, the president of Personhood USA, Keith Mason, spoke at the group's forum for GOP presidential hopefuls in South Carolina. "I would say this is an historic event because the most important issue in this race, in all of the races, is that of human life," Mason says. Personhood initiatives could appear on the ballot in more than half a dozen states. They would ban all abortions and some methods of birth control. Eleanor Smeal is with the Feminist Majority Foundation, which is fighting the effort. "The personhood amendments provide a big challenge to us, because there are so many circulating," Smeal says. "They are circulating them in some of the most important battleground states such as Colorado, Ohio and Nevada." Voters in Colorado and Mississippi have already rejected personhood initiatives, and not all anti-abortion groups endorse the strategy. But they are a way to redefine the political debate over the issue, and could provide a direct challenge to the U.S. Supreme Court decision that legalized abortion.